DR311K A0XV-0RD A0XV0RD OEM. Konica Minolta A0XV-0RD A0XV0RD DR311K DR-311K. Konica Minolta bizhub C220 C280 C360. Konica Minolta bizhub C360. Konica Minolta bizhub C220. Konica Minolta bizhub C280. Black Drum Unit. Only photo showing one in photos. These were extra one from my husband's office and they changed copiers so no longer need. Part Number(s): A1U9433, TN616C, TN-616C. Konica Minolta bizhub PRESS C6000, Konica Minolta bizhub PRESS C7000, Konica Minolta bizhub PRESS C7000P. Konica Minolta TN312. No exceptions. We will not mark any item as a “GIFT”. Konica Minolta bizhub C35. Konica Minolta bizhub C35P. Konica Minolta bizhub C25. It's easy to reach us! (Part # A0X5132, A0X5232, A0X5332, A0X5432, TNP22C, TNP22M, TNP22Y, TNP22K ). Konica Minolta bizhub C3350, Konica Minolta bizhub C3850, Konica Minolta bizhub C3850FS. For Use in the Following Compatible Machine Models Remanufactured: No. Konica Minolta bizhub PRESS 1052, Konica Minolta bizhub PRESS 1250, Konica Minolta bizhub PRESS 1250P. For Use in the Following Compatible Machine Models Remanufactured: No. Konica Minolta. No exceptions. One (1) TN616K Cyan Toner. One (1) TN616C Cyan Toner. One (1) TN616M Magenta Toner. One (1) TN616Y Yellow Toner. We will not mark any item as a “GIFT”. You are looking at a AAJ7030 OEM Toner from Konica Minolta. Konica Minolta. No exceptions. We will not mark any item as a “GIFT”. New ListingKonica TN221K Black Toner NEW in Box! Part Number(s): A88J130. Konica Minolta bizhub Pro 1100. For Use in the Following Compatible Machine Models. These boxes arenot resale condition boxes.Previous style box. Genuine Konica Minolta. No exceptions. We will not mark any item as a “GIFT”. Konica Minolta bizhub 4050, Konica Minolta bizhub 4750. For Use in the Following Compatible Machine Models Remanufactured: No. Part Number(s): A33K330,TN321M, TN-321M. Konica Minolta bizhub C224, Konica Minolta bizhub C224e, Konica Minolta bizhub C284, Konica Minolta bizhub C284e, Konica Minolta bizhub C364, Konica Minolta bizhub C364e. New genuine konica Minolta toner. 1-black, 1-yellow, 1-magenta. If interested in other toner check my listings. 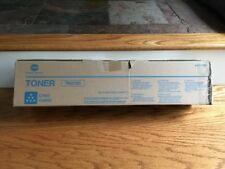 New Genuine OEM Konica Minolta Toner Drum DR510 024K . Condition is New. Shipped with USPS Priority Mail. Four New TN514K Bizhub Black Toner Cartridge A9E8130. Condition is New. Shipped with USPS Priority Mail. 1 Genuine Konica Minolta Magicolor A03100F Black Imaging Unit 4600 / 5500 / 5600 Series Type AM. ~~~~~~~~~~~~~~~~~~~~~~~~~~~~~~~~~~~~~~~~~~~~~~~~~~~~~~~~~~~~~~~~~~~~~~~~~~~~~~~. ~~~~~~~~~~~~~~~~~~~~~~~~~~~~~~~~~~~~~~~~~~~~~~~~~~~~~~~~~~~~~~~~~~~~~~~~~~~. Boxes are open, distressed. The bags are all still factory sealed. TNP22 Toner - For C35 Konica Minolta - Lot of 3 - CYAN YELLOW BLACK -. Condition is New. Shipped with USPS Priority Mail. Part Number(s): A33K130,TN321K, TN-321K. Konica Minolta bizhub C224, Konica Minolta bizhub C224e, Konica Minolta bizhub C284, Konica Minolta bizhub C284e, Konica Minolta bizhub C364, Konica Minolta bizhub C364e. It's easy to reach us! (Part # TN324C TN-324C, TN324M, TN-324M, TN324Y, TN-324Y, TN324K, TN-324K, A8DA330, A8DA430, A8DA130, A8DA230 ). Genuine OEM Konica-Minolta Pageworks 20 Toner Cartridge - Black. Condition is New. Shipped with USPS Priority Mail. Part Number(s): A3VX131,TN620K, TN-620K. Konica Minolta bizhub Pro C1060L. For Use in the Following Compatible Machine Models. Konica Minolta TN512 (Black, Magenta, Cyan, Yellow)Toner Cartridges -GENUINE. Condition is New. Shipped with FedEx Ground or FedEx Home Delivery. New genuine konica Minolta toner tn611. A full set plus a extra Cyan. So 1-black, 1-yellow, 1-magenta,2-cyan Check my other listings for different toner. KONICA MINOLTA DV-614K (A3VX600) Black Developer. Konica Minolta. No exceptions. Make sure that it is filled in correctly. Box styles may vary from what is pictured. Konica-Minolta Bizhub C550, C650. Laser Toner. 2x TNP22C - Cyan - A0X5432.